FILE - Judge Brett Kavanaugh, President Donald Trump's nominee to be an associate justice of the Supreme Court, speaks as he meets with U.S. Senator Cindy Hyde-Smith, R-Miss., on Capitol Hill in Washington, July 25, 2018. U.S. Supreme Court nominee Brett Kavanaugh's marathon testimony before the Senate Judiciary Committee last week does not appear to have changed the basic math that continues to favor the eventual confirmation of President Donald Trump's pick for the country's highest court. All but two of 51 Republican senators either have announced their backing for Kavanaugh or are widely expected to do so in the coming days or weeks. Kavanaugh's testimony did not appear to have cost him any support among Republicans, nor has it prodded two moderates in the caucus to declare how they will vote. "I look forward to voting for him," Tennessee Republican Lamar Alexander said in a statement late last week. "Judge Kavanaugh kept his cool this week and demonstrated the qualities that I look for in a judge or a Supreme Court justice — good character, good temperament, high intelligence and respect for the law." The vote tally also looks static among Senate Democrats, who number 49 in the chamber, including two independents who caucus with them. Recent days have seen a flurry of Democrats formally announcing their opposition to Kavanaugh, from Maggie Hassan of New Hampshire to Virginia's Mark Warner. But the announcements came from Democrats who signaled skepticism about Kavanaugh when Trump nominated him in July and had been widely assumed to be "no" votes from the start. Judiciary Committee Democrats repeatedly pressed Kavanaugh on abortion rights, gay rights, health care, executive authority and the ongoing Russia probe last week, but the often-contentious exchanges did not spur a critical group of centrist Democrats to commit to voting for or against the nominee. Neither Indiana's Joe Donnelly, Claire McCaskill of Missouri, Joe Manchin of West Virginia, North Dakota's Heidi Heitkamp nor Florida's Bill Nelson posted any statements or tweets about the high court nominee during the confirmation hearings or in the days since. All are running for re-election in states Trump won in 2016 and are caught between pressure from within their party to oppose Kavanaugh and a desire not to anger and mobilize conservative voters in their home states ahead of the November elections. Donnelly, Manchin and Heitkamp voted to confirm the president's first Supreme Court pick, Neil Gorsuch, last year. Even if all Democrats voted against Kavanaugh, two Republicans would have to join them to defeat the nomination, now that the Republican caucus is at full strength, with Jon Kyl filling the seat of John McCain of Arizona, who died last month. 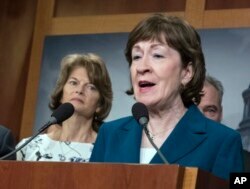 FILE - In this Feb. 15, 2018, photo, Sen. Susan Collins, R-Maine, and Sen. Lisa Murkowski, R-Alaska, left, are shown during a news conference at the Capitol in Washington. Susan Collins of Maine and Alaska's Lisa Murkowski back abortion rights, which could be threatened if a socially conservative five-seat majority were cemented on the Supreme Court. Both Collins and Murkowski voted to confirm Gorsuch but have given noncommittal statements about Kavanaugh. Last year, the majority Republicans changed Senate rules to require only a simple majority, 51 votes in the 100-member chamber, to confirm a Supreme Court nominee. In the event of a 50-50 split, Vice President Mike Pence would cast the deciding vote.